My good friend in Missouri, Robert S., reacted immediately to my posting last Sunday…the Downton Abbey/Vatican-hierarchy reflection…..He has written what he would like to see as a Papal Tweet. I added just a few modifications. It is a bit longer than the usual tweet of 140 characters. But then…It is a PAPAL TWEET. Holding the Keys of the Fisherman the pope does deserve some special perks. Inspired by the fact that the Holy Spirit came down upon all in the upper room at Pentecost, and continues to dwell within all the faithful to bring Christ’s message about God’s love for us to the whole world, I too am compelled to give voice to this same Spirit in the pathways of the world using whatever means available, as our beloved predecessors have always done. Our communication networks today – smartphones, iPads, Facebook, etc. – break-down the old authoritarian structures; level hierarchies; and put all of us on an equal horizontal level of brother-sister shared responsibilities. 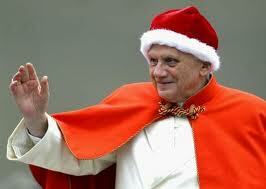 These changes are particularly difficult for me and for the papal office. Change is in the wind. Change must come. God’s Spirit is with us. This doesn’t sound like the news bites of Pope Benedict that we are accustomed to hearing, but rather such articulations – “The old authoritarian structures must go” and paying homage to “God who is our Mother and our Father” and “mother-earth,” all are speaking reverently to ears that have awaited respectful dialogue. Could this be the beginning of something real ? The real has indeed begun with or without a tweet……. Oh, the dreams that one can dream! While Robert S has a wonderful idea– it takes two to have a conversation, Sadly I read that the Pope will only send tweets and not read them. What will be the present day “roses of Castille’ which will enable us Juan Diegos to gain the ears of our Bishops? Perhaps when they no longer have the funds to polish their croziers they will listen to those who fund them? grabbed folk’s attention? I mean PPT16 : Proposed Papal Tweet for Pope Benedict XVI | Another Voice is a little vanilla. You should look at Yahoo’s front page and see how they write post headlines to get people interested. excited about everything’ve written. In my opinion, it could make your posts a little bit more interesting.